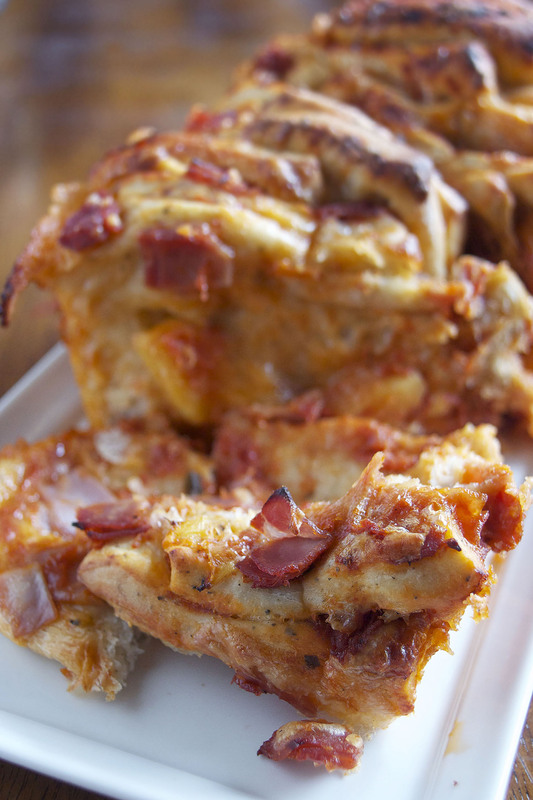 Ready to bake in just over an hour, this pizza pull apart bread is the perfect combination of pizza and fresh bread! In a large bowl combine flour, salt, onion powder, garlic powder, herbs, sugar and yeast. Stir to evenly mix the ingredients. In a separate bowl combine milk, butter and eggs. Mix together, scrambling eggs and completely combining the wet ingredients. Pour the wet ingredients over the dry and stir until everything comes together to make a dough. This will start out as a wet dough. Turn out onto a heavily floured surface and hand knead for about 8 minutes or until the dough becomes smooth and elastic. Grease the bottom of the mixing bowl lightly with a non stick spray or lightly coat with butter. Place dough in the bowl, turn and flip so the top is lightly coated with spray (or butter). Cover and let it rise in a warm place for about 30 minutes. It should nearly double in size. Grease two loaf pans with non-stick spray. Gently punch down the dough and turn out onto a lightly floured surface. Cut the dough in half and place one of the halves back in the bowl, rolling out the other one into a rectangle. Once the dough is rolled out into a rectangle measuring approximately 18 by 10 inches, evenly spread one cup of tomato sauce on top of the dough. Sprinkle on 2 cups of shredded cheese evenly on top of the tomato sauce, then spread half of the ham on top of the cheese. Top with half of the pineapple chunks. Cut the dough into five strips using a knife or pizza cutter going the shortest direction. Your strips should be about 3 ½ by 10 inches long. Stack the strips on top of each other with the tomato sauce layer on top. Cut into four equal pieces. Lay the pieces in the greased loaf pan, cut side up. Repeat with the second half of the dough to form the second loaf. Cover pans and let the loaves rise in a warm place for 20 minutes. They won’t quite double in size. Preheat your oven to 350°F while the loaves are rising. Let breads cool for about 10 minutes in the loaf pan, then remove from the pan and cool directly on a wire rack. Recipe created by Try Anything Once Culinary.